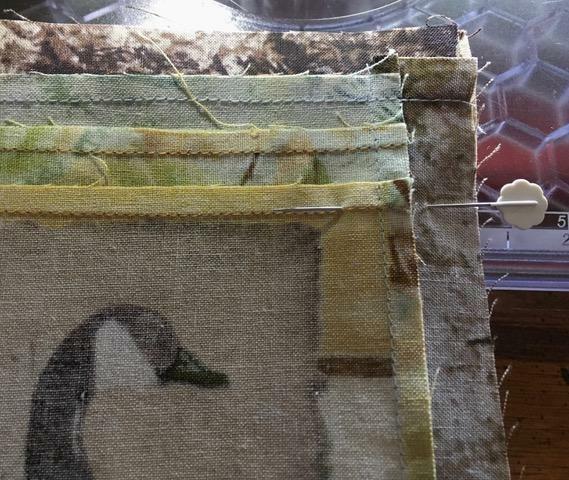 A couple of years ago, Sue gave me several boxes of fabric and scraps. 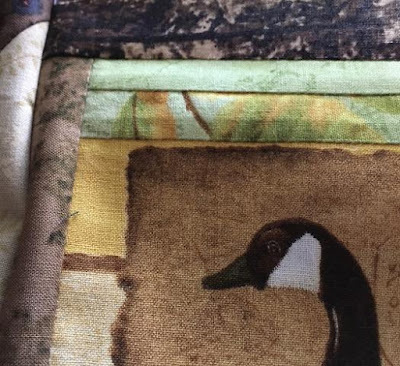 One box contained a partial wildlife panel, and I delayed using it because some of the panel "blocks" had issues: the fabric had been cut close to the printed blocks, and they needed to be made larger. To do that, I salvaged some fabric from the largest blocks (usually about a half an inch) and made the undersized blocks larger. 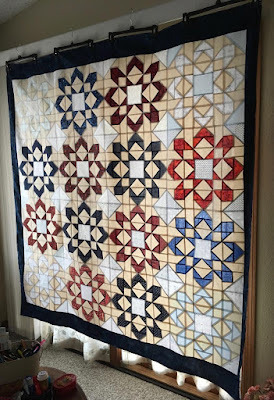 Once I was ready to start the quilt, all of the blocks were framed with dark brown. The Canada goose block is the only one that required two strips. 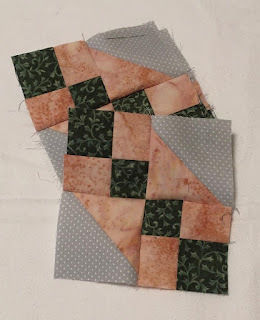 I would have preferred to use one strip, but I didn't have enough scrap fabric for a single strip repair. The "repairs" aren't as noticeable in the undersized deer and eagle blocks. 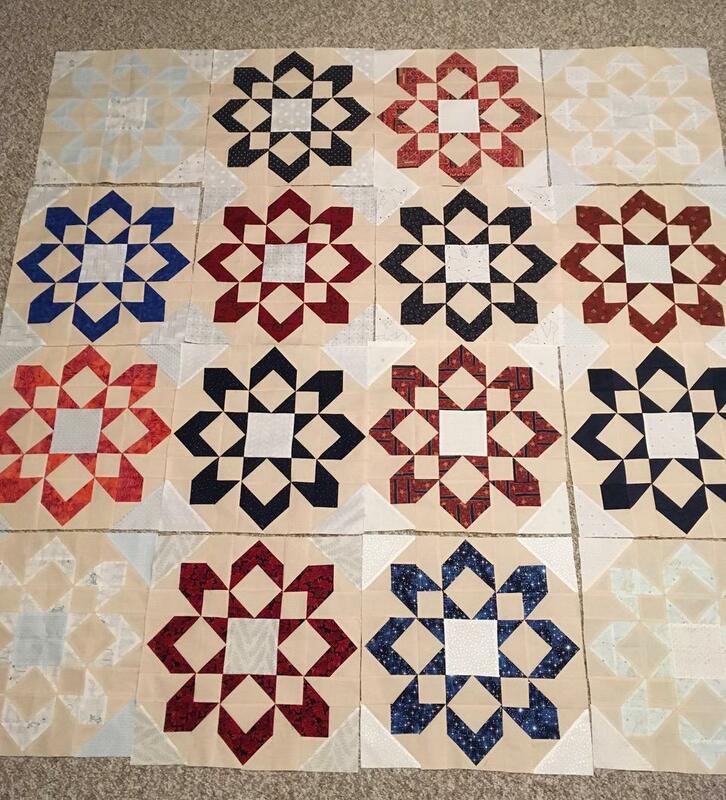 Once the top is quilted, I'm hoping the repairs will blend into the background. Stephanie's slippers are nearly finished: I just need to knit the attached i-cord around the edge. It's a slow process, but the result is wonderful. The i-cord gives the slippers a polished look. 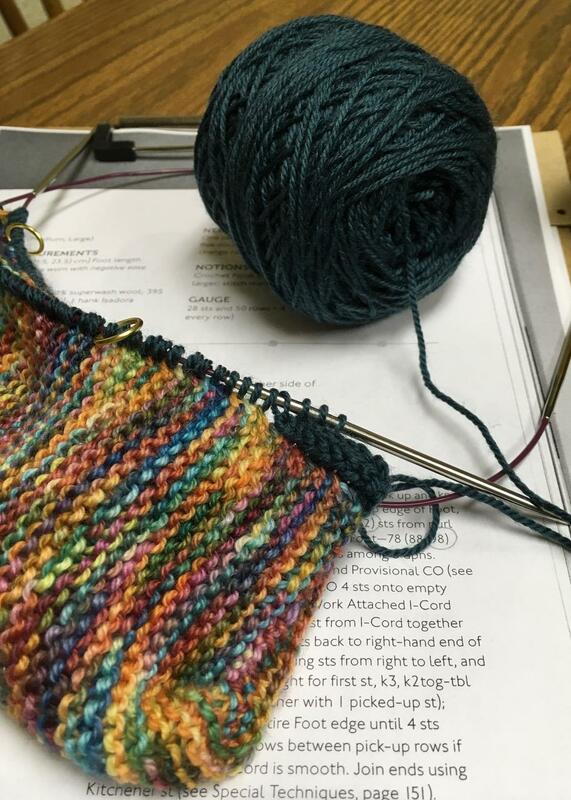 If the teal yarn looks familiar, it's because it's the yarn I used to repair my nephew's sweater/jacket last month. It feels good to be knitting again. The blocks I showed yesterday were used to create the border around the deer panel. 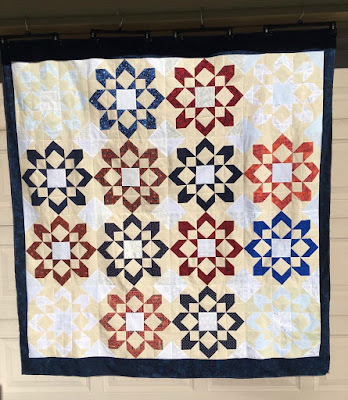 The free pattern is available online. 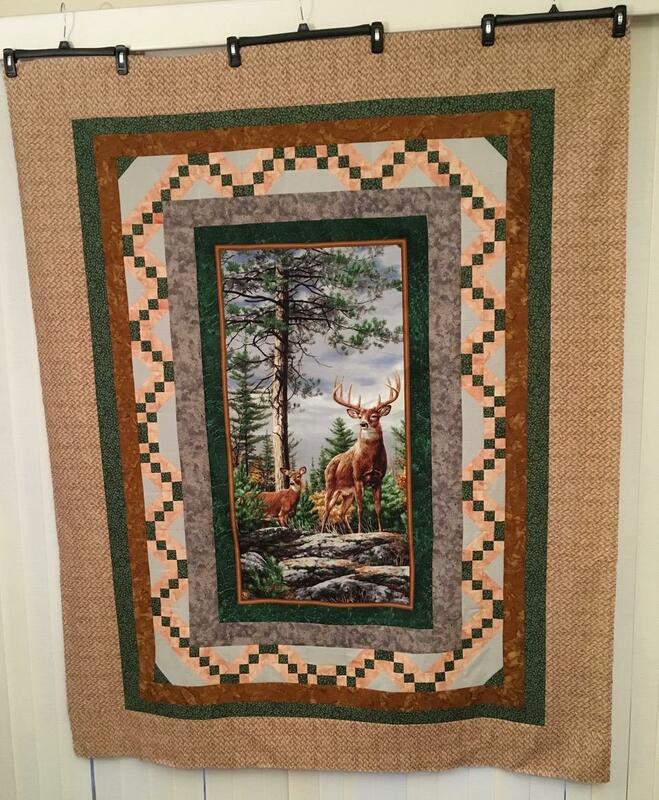 I added width by increasing the frame and added an additional border. 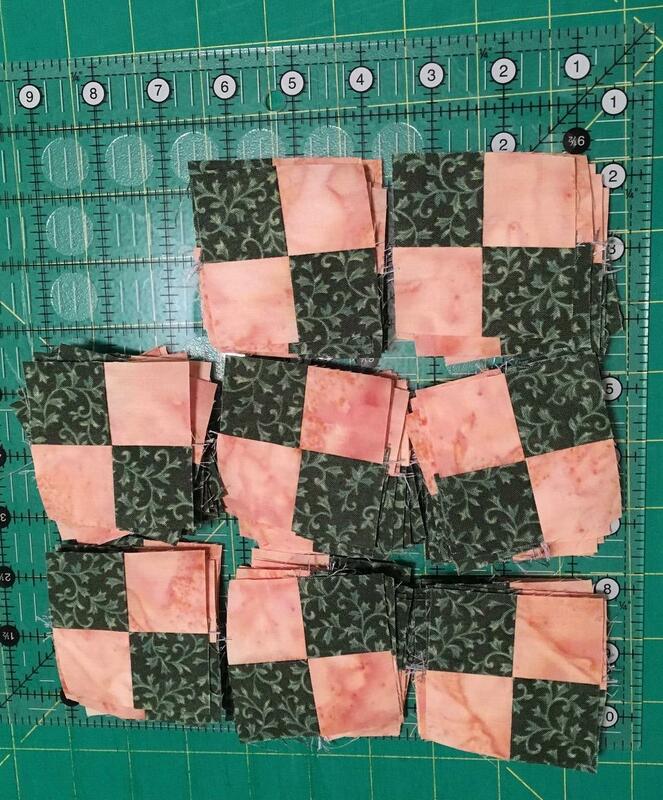 I've been doing a lot of chain piecing (sewing multiple pieces in a continuous chain) recently - half square triangles (HSTs), four patches, and flying geese. 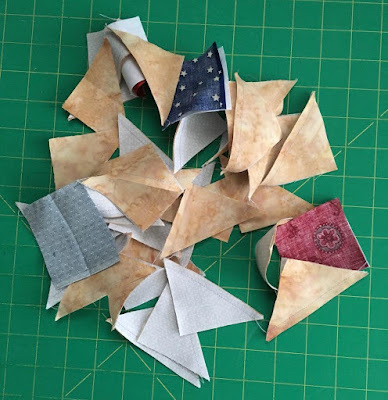 A recent project required 64 HSTs, and to keep track of my count, I sewed ten HST units followed by a colorful section of a four-patch; thus, to keep track of the required HSTs, I counted the four-patch sections. Taking a quick glance at the pile of sewing in the photo, I can tell there are forty HSTs. 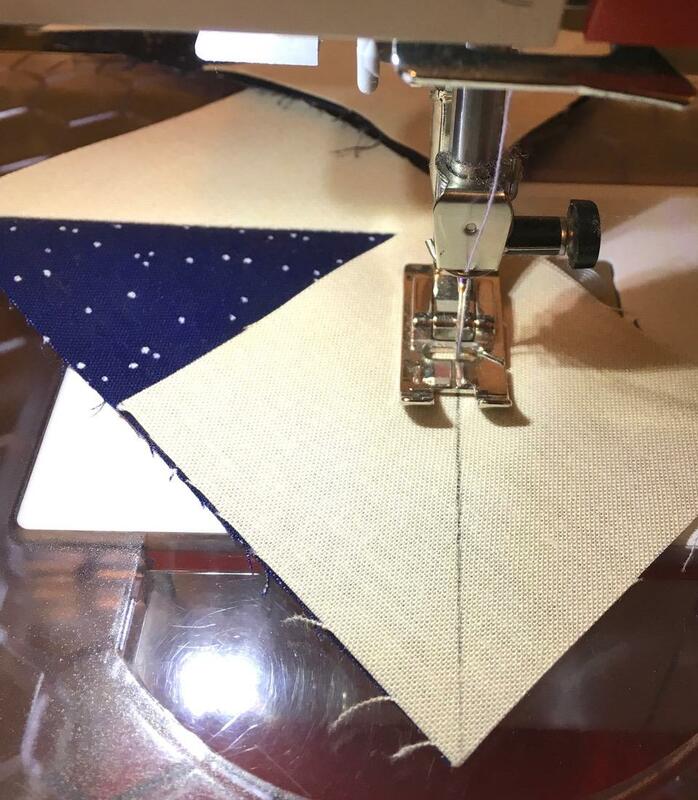 It didn't take long to sew twenty-four more HSTs. and turn them into blocks. If you're a quilter, how do you keep track of the required components when chain piecing? 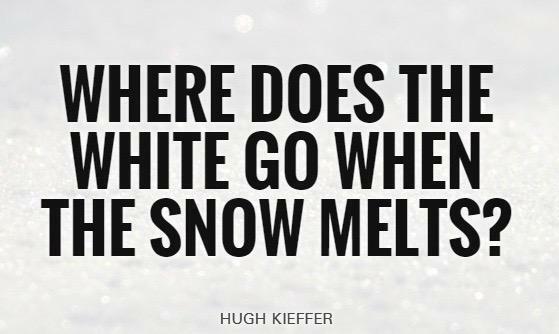 I'm not a fan of Winter cold, but I love the beauty and silence of Winter. 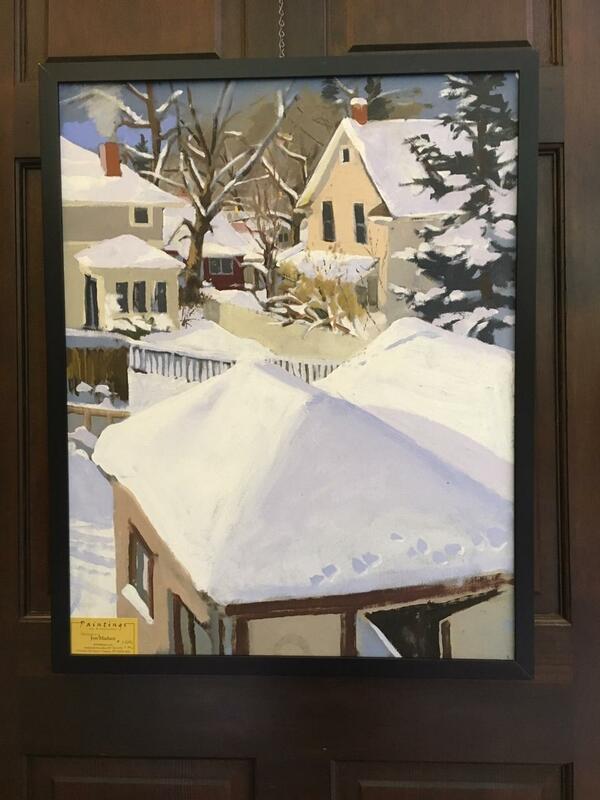 This painting was on display at the Eppson Center for Seniors in December, and I admired it every time I entered the dining room. In my opinion, the artist captured the winter light perfectly. 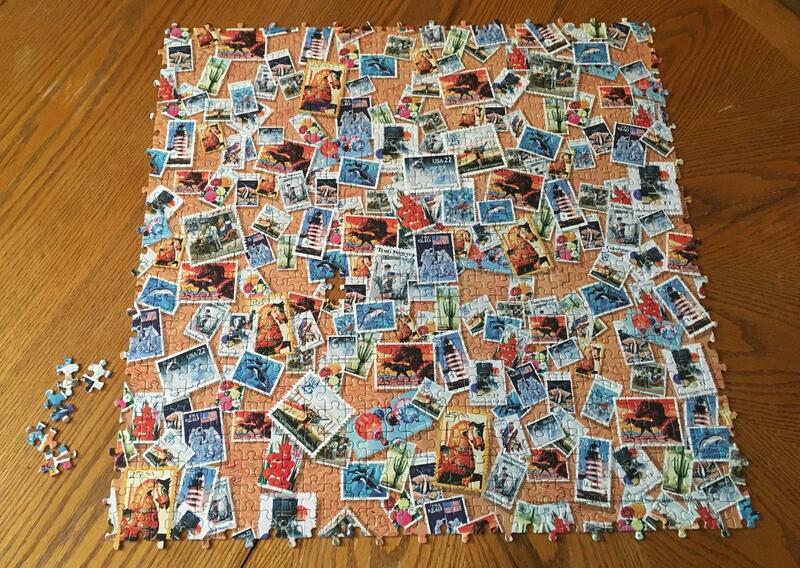 I'd love to purchase the piece but settled for a photograph. Today's ponderable . 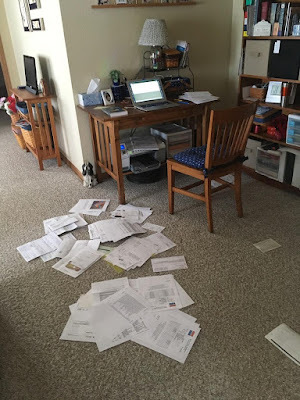 . .
Sunday afternoon, I organized my receipts for the 2018 tax season. I keep an Excel spreadsheet for various categories and update the file every month. In January, I review the entire file and bundle the receipts for my records. When I receive all the necessary forms from banks, etc., I'll send the essential information to the accountant. I know the new tax law will affect deductions, so much of what I track may not be needed this year. 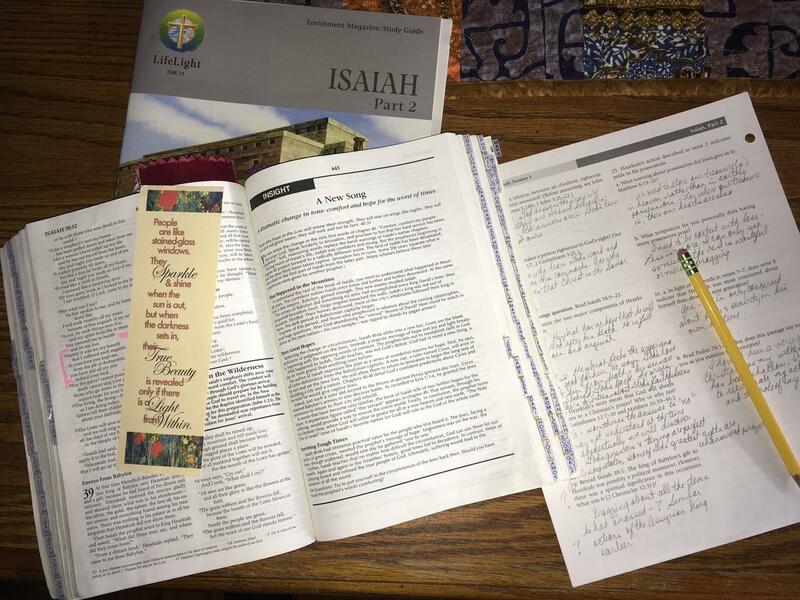 Have you started working on your Federal Income Taxes? 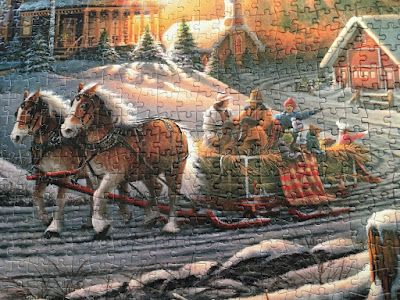 Snowy days are perfect for sewing, reading, knitting, and assembling jigsaw puzzles, but they are also great for cooking. It's difficult to cook for one person, and if I don't prepare meals for the freezer, I tend to snack rather than eat a healthy meal. I noted the weather forecast on Thursday and decided that Friday would be a day for preparing freezer meals. I gathered the ingredients for several dishes and began cooking. 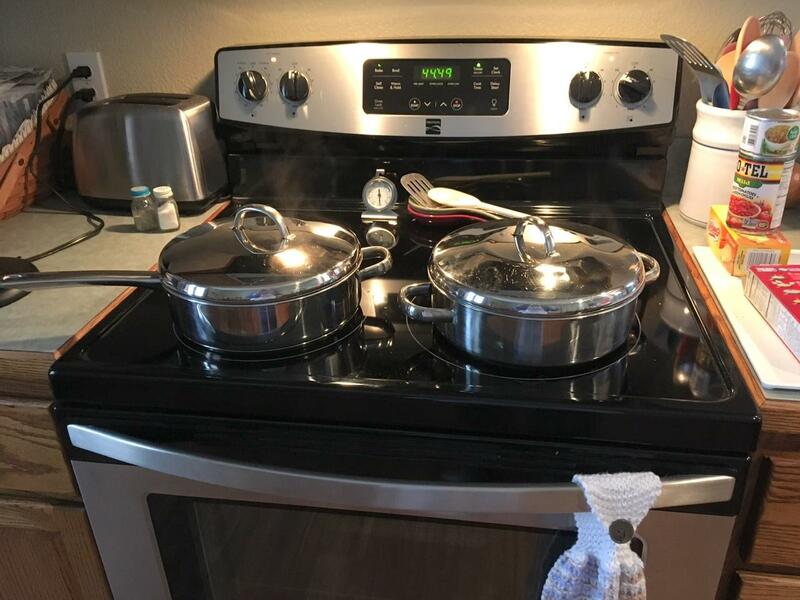 I made two dishes on the stovetop, one in the crock pot, and one in the oven. Once the dishes are ready, I cool them a bit before placing single portions in freezer containers. By the time I was finished on Friday, I had eighteen additional containers in the freezer for my evening meals and enough variety to satisfy. I'll supplement the portions with a salad, etc. Do you prepare freezer meals?
. . . I avoid interstate 80 in southern Wyoming, especially in the winter - blowing snow, black ice, horrific winds (usually 60+ mph), impatient drivers, and LOTS of semis. 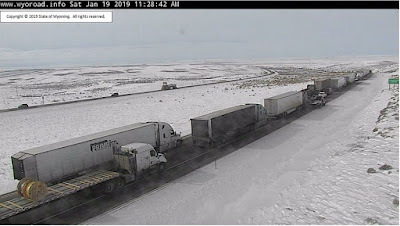 Posted on Saturday, January 19, 2019 by WYDOT: "Several crashes along Interstate 80 are affecting traffic. The interstate is opened, but delays are possible. This picture shows traffic backed up westbound near milepost 206. There is also black ice and a blowover risk along parts of the interstate and sections are closed to light and high-profile vehicles." Anymore, I-80 is packed with trucks, hauling vital supplies east to west and back. If you enlarge the image, you will see the line of backed up traffic (mostly trucks) snakes around the bend and off the photo at the horizon. 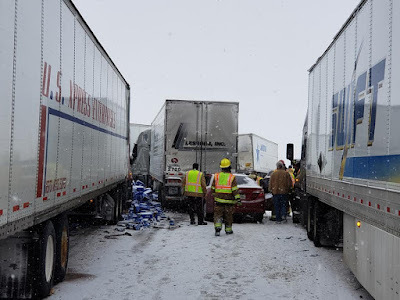 When the road is closed due to accidents, weather, or road conditions, towns along the interstate are packed with trucks waiting for the road to open. If at all possible, I travel other roads to avoid the big rigs. Massive crashes involving semis are common place on Interstate 80 through Wyoming. Imagine the terror of being the driver or passenger of that red car as the semis began crashing into each other. 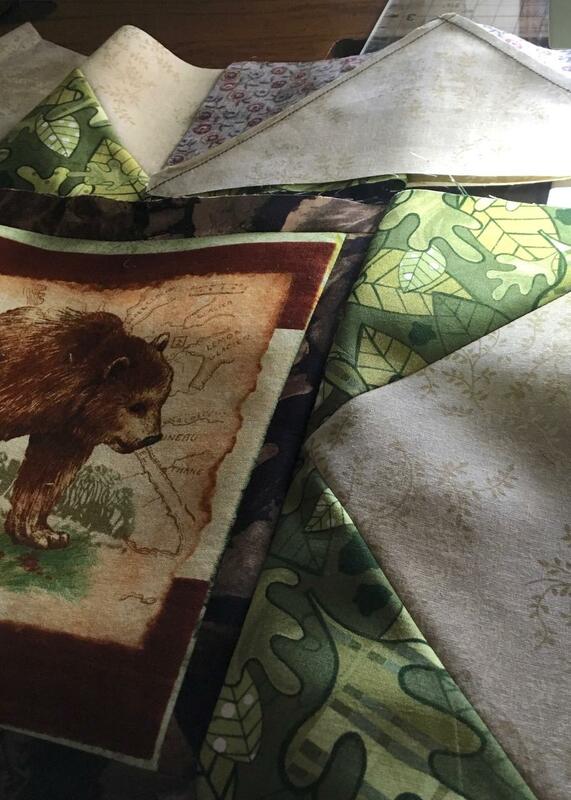 April 2015 saw four massive pile-ups in less than a week on a fifty-mile stretch of Interstate 80 between Laramie and Cheyenne, Wyoming. NBC News covered one of the crashes in this article. An article on page 10 of WYDOT's September 2017 issue of Interchange stated, "Interstate 80 - a major national trucking corridor - sees thousands of trucks per day on their way through Wyoming. As many as half (or sometimes, more) of the vehicles on sections of I-80 are trucks." The following video is not for the weak-hearted. It was filmed on Interstate 80 (Wyoming) on April 17, 2015. If you watch it, make sure you have the sound turned on. 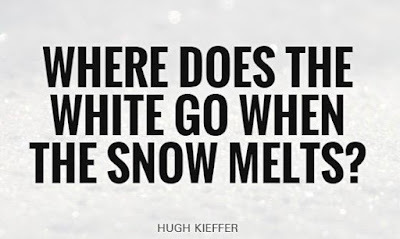 And that is why, I avoid driving on Interstate 80, especially during the winter. Over the weekend, I started making a list of potential projects to work on in 2019. 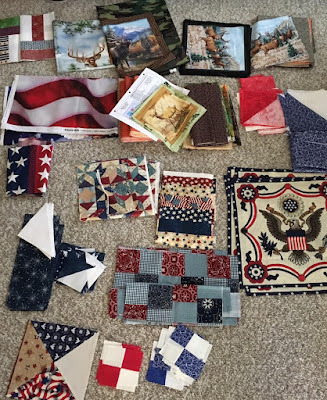 As I looked through the bins and baskets in the sewing room, I found parts of previous projects, panels, and orphan blocks. 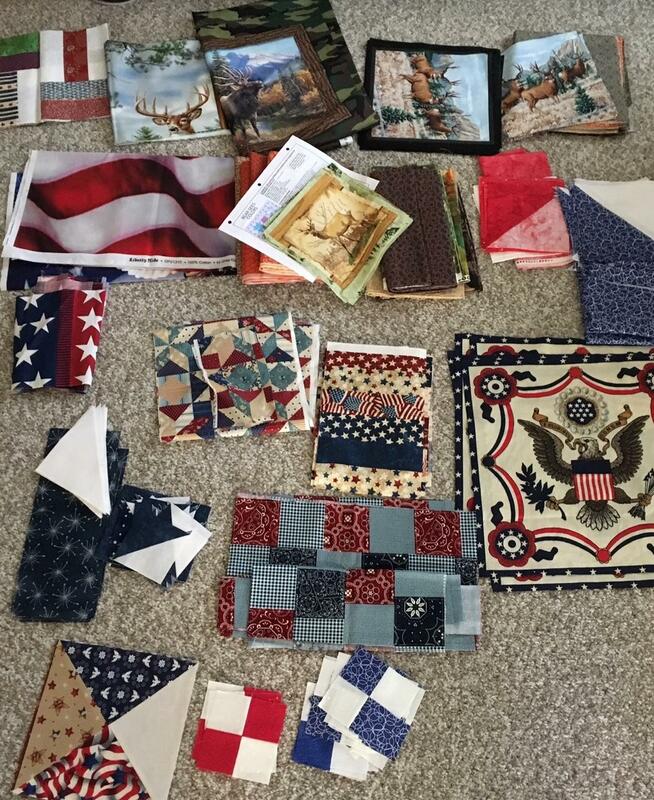 Hopefully, I'll be able to find a use for the assorted bits and pieces. The yarn that fooled me twice is getting yet another chance to become a finished object. Maybe, the third attempt is the charm. I decided to knit a simple garter stitch scarf with the lace weight yarn and randomly add some eyelet lace. 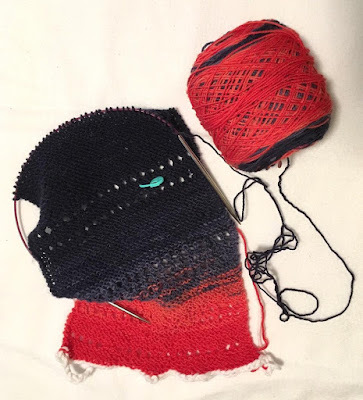 I began with a provisional cast on, so the two ends can be grafted easily into an eternity scarf. 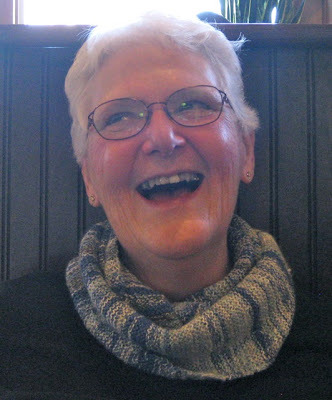 Since the Sky Scarf, knit in 2013, is one of my favorite accessories, I thought a similar scarf would be worn a lot. 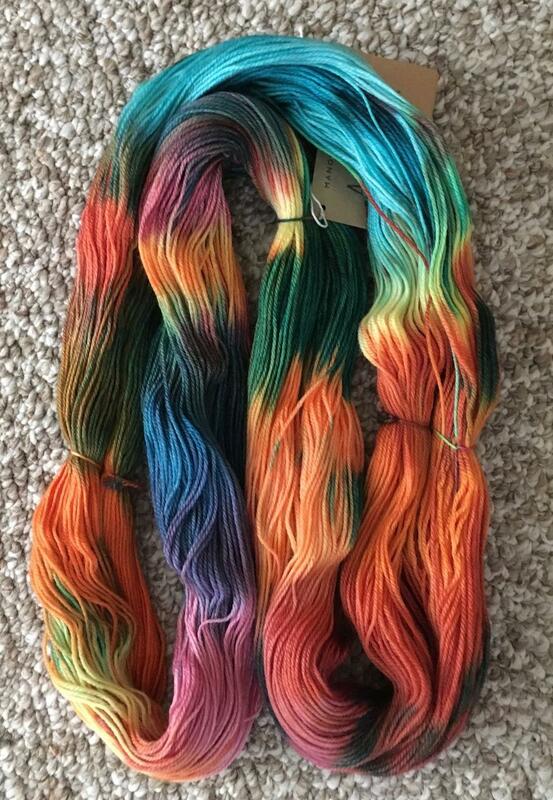 So far, the yarn is behaving itself: it must be happy with my plan. 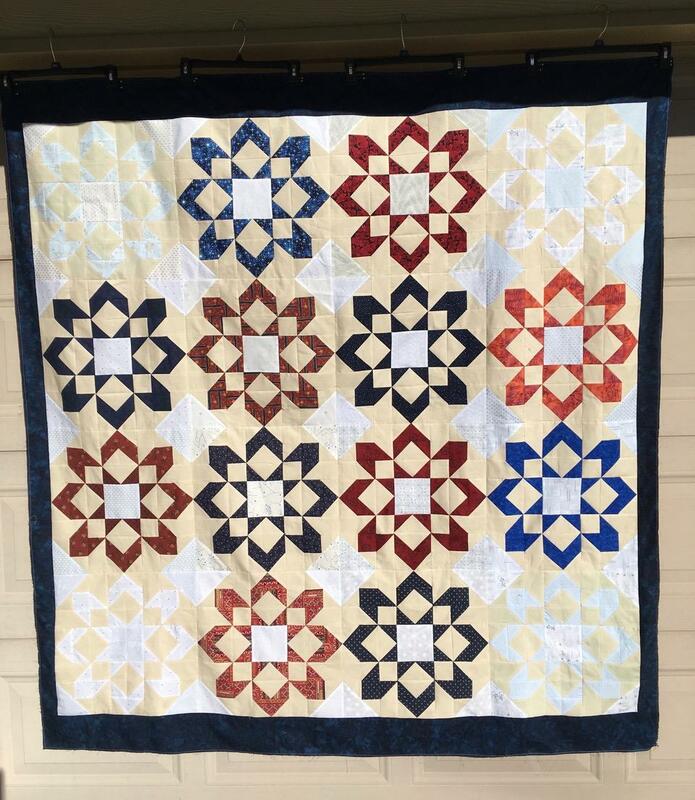 The first Quilt of Valor finish for 2019 is the UFO I received from LeAnn H. Previous posts about the UFO gift can be seen here, here, here, and here. LeAnn, thank you for trusting me to finish your project and for making this Quilt of Valor possible. I love how it looks like stained glass hanging in front of my patio door. 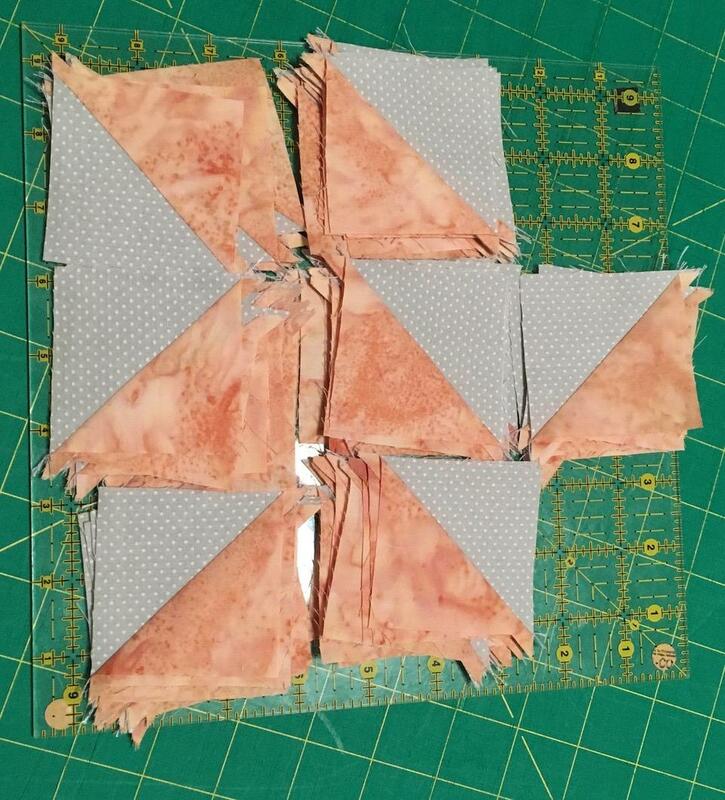 Over the weekend, I finished sewing the final blocks for the UFO project I received from LeAnn H. Each block contains twelve, flying geese units, and eight, half flying geese units. 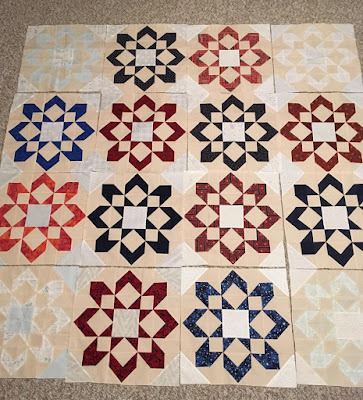 The last set of blocks was finished and pressed on Saturday evening. 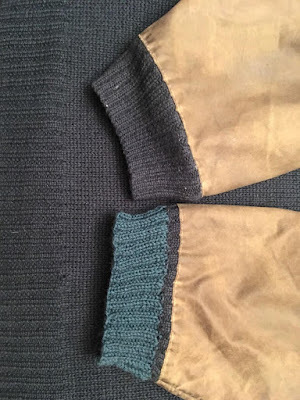 My nephew brought a favorite Filson wool and leather sweater to Colorado last week hoping his Mom could repair the tattered cuff. 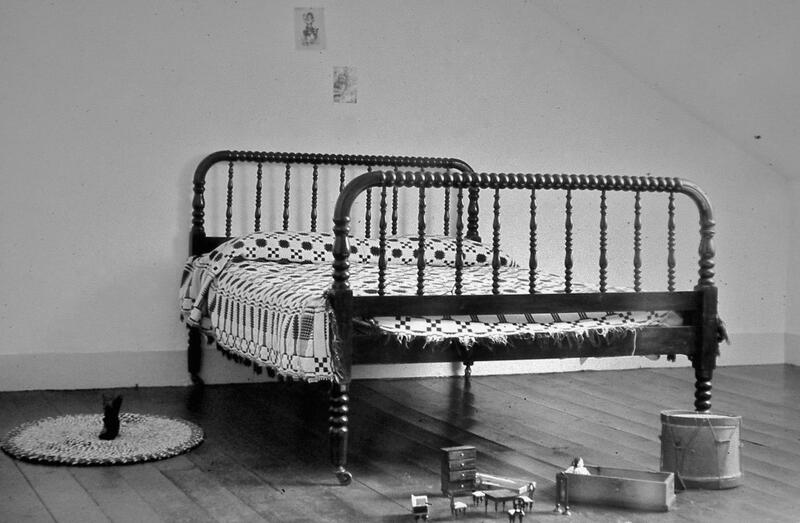 He thought she could repair it with her sewing machine. The sweater section of the jacket/coat is 100% wool, so I thought I could knit a new cuff on the sweater. 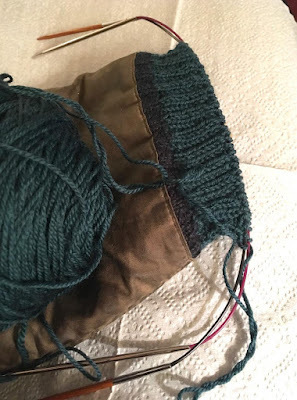 I began by marking the stitches about a quarter of an inch from the edge of the leather sleeve covering the knitted wool sleeve. 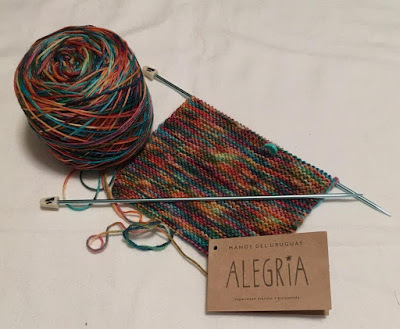 I didn't have my small needles with me, so Marilyn and I went to a yarn shop and purchased a small skein wool in a color close to the original color and some size two circular needles. 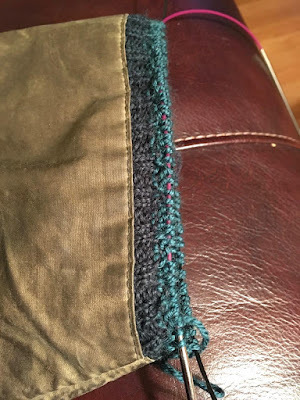 The repair was not without some frustration: picking up the stitches was difficult because the stitchess were so tight, and just as I was beginning to knit the first row, a tip broke off one of the wooden needles. Thankfully, Marilyn's neighbor is a knitter and was willing to loan me a metal circular needle. I tucked the damaged cuff inside the sleeve as I knit the new cuff, as I didn't want to cut it off until I was certain the repair would work. After the cuff was completed, I sewed along the edge of the old cuff (inside the sleeve) with a small zig zag and straight stitch. 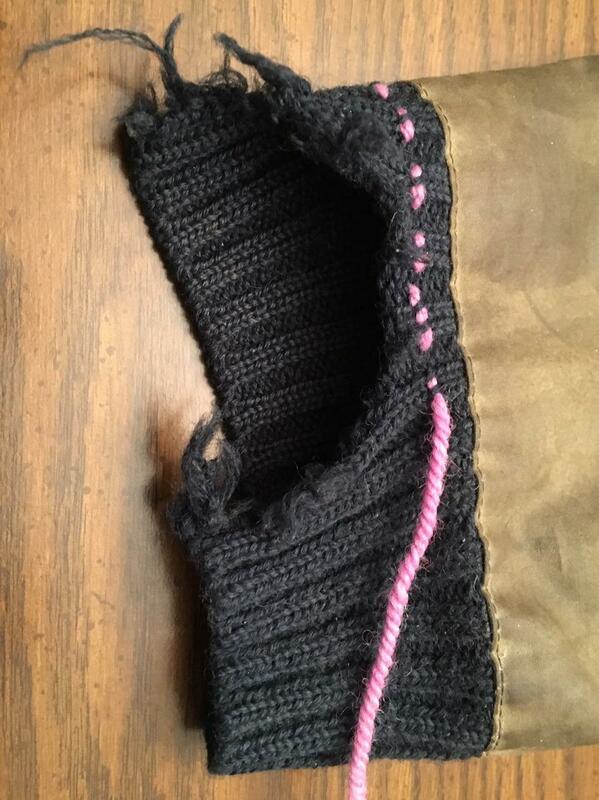 The old cuff was cut off close to the stitching. The cuffs are different colors, but my nephew is thrilled that the life of his favorite jacket/coat has been extended. 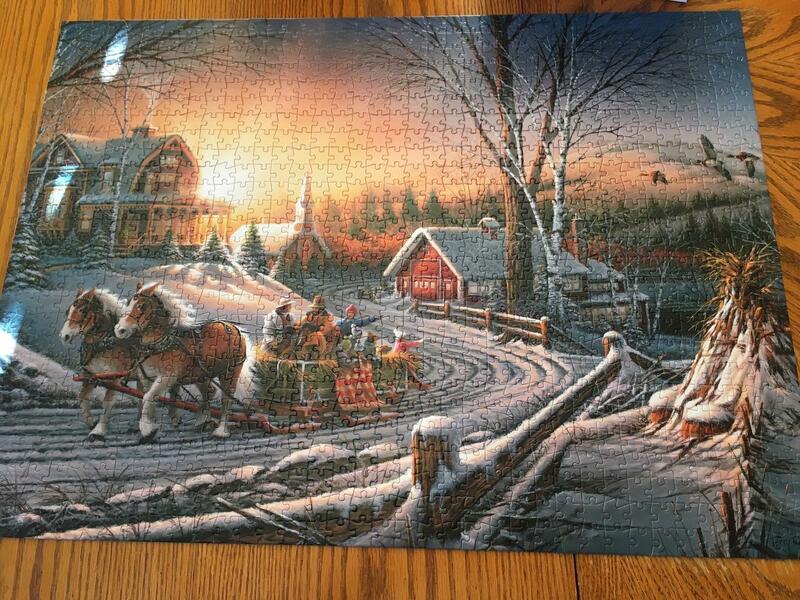 Brenda and I assembled two puzzles last week. 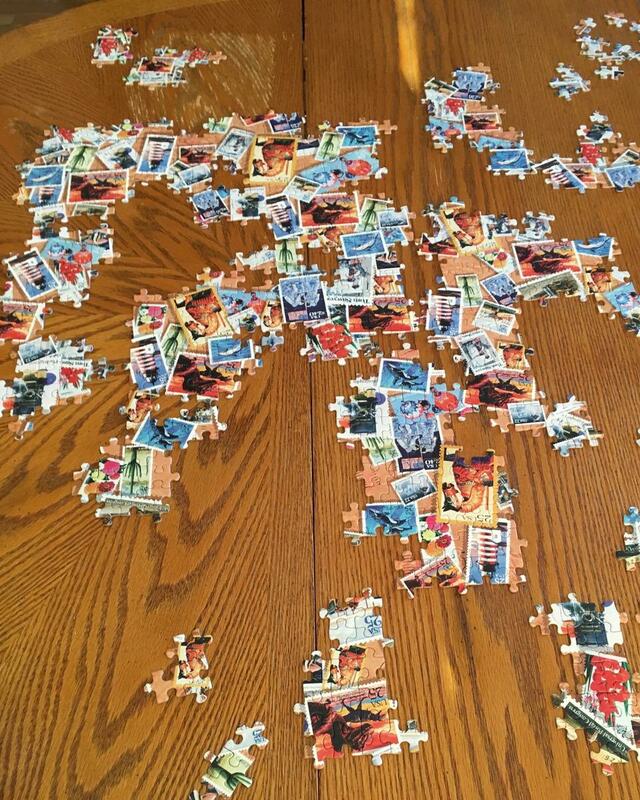 We both love the challenge of a good puzzle. 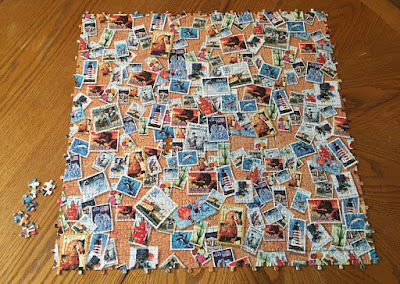 The 1,000 piece Redlin puzzle was started on Saturday evening and finished on Sunday morning. The second puzzle (750 pieces) was more difficult: it included five extra pieces and did not have any straight edge pieces. 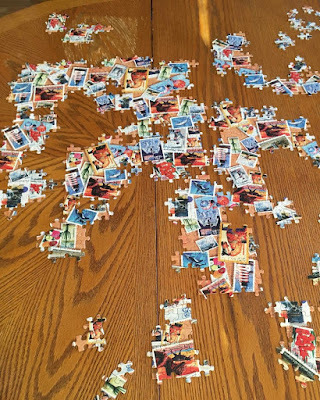 Brenda and I worked on the puzzle in sections and eventually the sections were connected with each other.